The TrueTalk Fluency Rater can be purchased by cheque, money-order or official purchase order by completing a TrueTalk order-form and returning it to us by fax or email. Payment must be made in Australian Dollars. The TrueTalk costs AUD$550. For Australian orders this price includes GST and delivery. International orders are GST free but the increased world-wide shipping costs result in the same overall price (AUD$550). Please contact us for special pricing on orders of 5 or more units. Please note that the order-form is in Adobe Acrobat (.pdf) format. If you do not have the free Adobe Reader you may download it from the Adobe website. Click here to download the TrueTalk order-form. 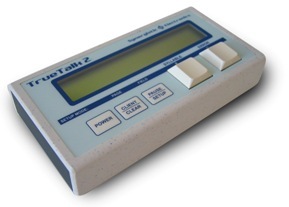 If you wish to pay by credit card you can order the TrueTalk Fluency Rater online.